DRAWSKO POMORSKIE TRAINING AREA, POLAND. 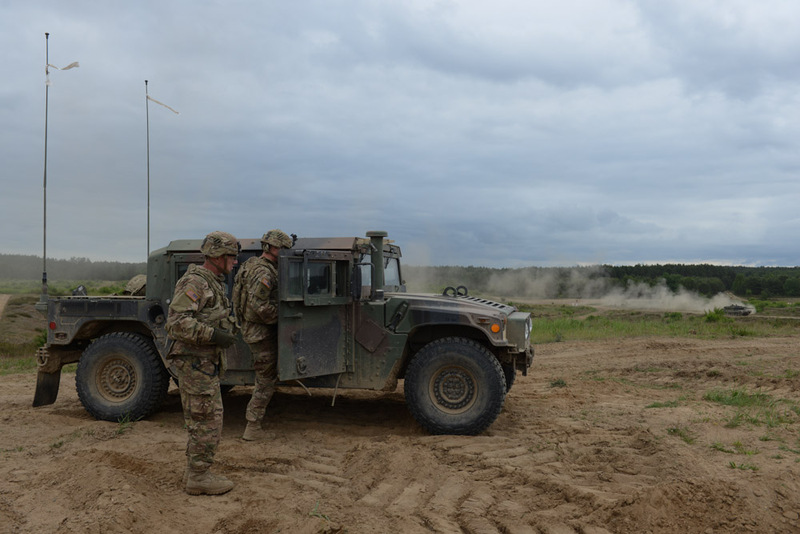 American soldiers with the 2nd Battalion, 7th Infantry Regiment, 1st Armored Brigade Combat Team, 3rd Infantry Division based out of Fort Stewart, Georgia beside a Humvee before a live fire exercise with a German-made Danish Leopard 2A5 tank on the horizon on June 16, 2015. NATO is engaged in a multilateral training exercise "Saber Strike," the first time Poland has hosted such war games, involving the militaries of Canada, Denmark, Germany, Poland, and the United States.